This year, I decided on a staycation break around the UK and planned it as a complete surprise for Liv. From one day to the next, she had no idea where we would be, what we would be doing nor who we would be meeting! We were very lucky that for the most part the weather was on our side and made the trip to our first port of call that much better. Having previously mentioned the many Ironbridge Gorge museums and activities available over the holidays, it was time to experience it for ourselves, so our first family staycation stop was Telford, Shropshire! Having researched the 10 Ironbridge museums and noted my favourites, we first headed for the actual Iron Bridge and Tollhouse! Unfortunately the bridge (the first major bridge to be made of cast iron) is currently covered up due to restoration building work (due to finish in October 2018), but it did not detract from how amazing the bridge is and the stunning little village it is situated in. Walking over the bridge which is still open for use and into Ironbridge village was breathtaking. With lots of places to sit and take in the breathtaking views, there are plenty of tearooms and pubs to enjoy a drink by the river and soak up the glorious weather we have been experiencing. We even managed to find a Shropshire Rock! 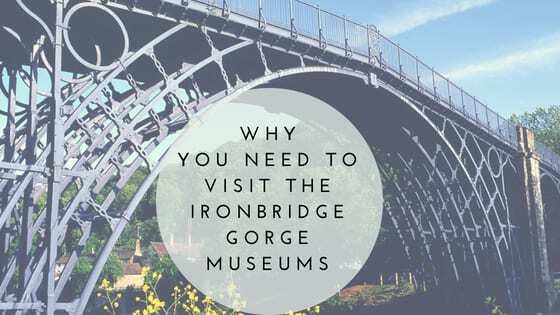 A short walk from the bridge and you will find the Museum of the Gorge which is also part of the local Visitor Centre – a really interesting centre which offers information on the history of Ironbridge Gorge and surrounding Coalbrookdale area. The 40ft diorama representing the visit of King George in 1796 is rather special and we thoroughly enjoyed checking out how things would have been back then. There were a few interactive activities to help children learn more about the Iron Bridge and the area industry. The Museum is small, but does feature a seated area with a small film presentation alongside all the exhibits, the view however was stunning and was a great complement to the position of the Museum of The Gorge. Next we moved onto Blists Hill Victorian Town, which is literally five minutes down the road, with plenty of parking. I was excited to visit this particular museum and it certainly did not disappoint. Complete with a perfectly laid out dining room. I wouldn’t have liked to have visited the dentist after all those sweets though! Characters were dressed up in traditional Victorian costume and were happy to engage with everyone, detailing how life would have been back in the day. We popped into the Bank where you could exchange money for token Victorian coins that could be spent in the shops in the town. This particular gentleman was an absolute hit as he gave a talk on how the mines used to operate – it was very interesting to find out the job of managing the lift ran in families and watch how the mine shaft lift worked. Such impressive engineering! The candle dipping demonstration was fantastic and even Liv didn’t complain about how hot it was in the candle house. The actions of candle dipping was somewhat hypnotic and the process was fascinating for both adults and children. Between 21st July and 2nd September, activities relate to ‘Create Industry’, each day there is a different activity that you can take part in that brings alive the industrial past. One of the activities on the day we visited was to dip and make your own candles, though if you are looking for a more sedate activity you could also take a ride on the carriage pulled by wonderful horses! The weather was on our side that day and it was incredibly hot, kudos to everyone dressed up in Victorian clothing! When we needed a rest, we found plenty of places to sit down, including a beautifully cultivated garden and a cafe near the entrance to the town. Our favourite spot was next to the river looking over at the old brick and tile works, which I am sure you will agree was a fantastic spot! I was really impressed with the two museums we visited and it has made me want to visit all of the Ironbridge Museums. All well laid out with easy parking, you could tell everyone enjoyed working there and it was easy to see why – everything was pristine clean too and well maintained. You can easily spend hours at Blists Hill Victorian Town, but with 9 other museums to visit an annual pass is the most reasonably priced way to experience all of the Ironbridge Gorge Museums at your leisure. The Annual Passport Ticket allows multiple visits into all 10 museums and costs £26.50 per adult, £20.50 for seniors, £16.50 for children (16 years or under), £70 for a family of two adults and all their children and £50 for a family with one adult; under 5s free (terms and conditions apply). You can purchase Passports online to take advantage of a 5% saving! Individual entry tickets are available at each museum. Activities will vary from day-to-day and some additional costs will apply. With so many activities and exhibits taking place at the museums during the year (including a ghostly gaslight evening on October 27th and a spectacular fireworks display at Blists Hill on November 3rd), it is well worth checking out the Ironbridge.org.uk site for further details to plan your visit. We thoroughly enjoyed our visit to the Ironbridge Gorge Museums and it was a great way to kick start our staycation. With the bridge on course for being completed in October 2018, I will be looking into an annual pass for next year so that Liv and I can return, maybe update some images and definitely try some of those fish and chips!